Third year in a row Bee is producing co-champions. Well, what a finish! Like the last couple of years, the Bee has again produced co-champions — despite the best efforts by the organizers to prevent that from happening. Again, more Indian American champions. Nine times in the past nine years. If this isn’t a dynasty, then what is? Congratulations to both Janga, the youngest ever champion, and Hathwar, the second one from his family! Read our final report here. Also, do check out our YouTube channel for interviews with the two champions. The ping pong match continues! No more than 5 rounds remaining! Janga spells the insane word”Promyshlennik” correct! 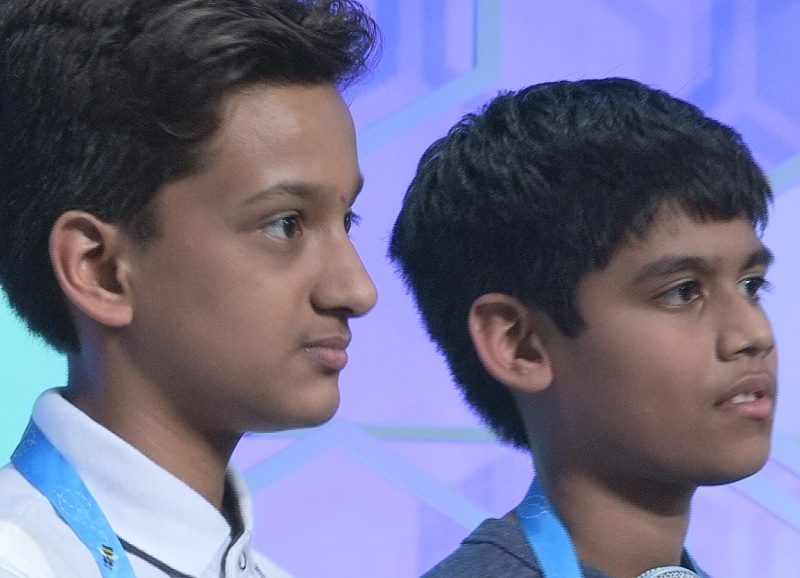 That means if Nihar Janga spells the 2 next words correctly he will the youngest Scripps National Spelling Bee winner ever! The duo is spelling word after word correctly! The two seem to get better and better each round, as no more than 21 rounds remain. Nihar Janga spells “schepen” correctly! Jairam Hathwar, one of the two final spellers left, spells the incredibly tough word “gelandesprung” correctly! Snehaa Kumar spells “usicapion” incorrectly, leaving Jairam and Nihar as the final two. With the elimination of Lamontagne, the next champion will also be an Indian American. Sylvie Lamontagne is next. Takes a deep breath! Spells CHAOBORINE. The correct spelling is chaobborrhine. Gets standing ovation. Snehaa Kumar gets the word “nasaump.” Spelled correctly. Nihar Janga receives a big round of applause as he spells “quillon” correctly. Jairam Hathwar survives yet another grueling round by spelling “collyridian” correctly! Sylvie Lamontagne spells “ekka” correctly. Snehaa Kumar begins round 14 by spelling “aplustre” correctly! The rounds keep getting tougher and tougher as round 13 comes to an end, with no eliminations, however. Nihar Janga spells “bailliage” correctly! Jairam Hathwar spells “caracal” correctly. Snehaa Kumar spells “poitrel” correctly to begin round 13. Nobody gets eliminated in round 12, as round 13 begins. Nihar Janga spells “gisant” correctly! Jairam Hathwar stays alive by spelling “epergne” correctly! Snehaa Kumar kicks off round 12 by spelling “prochoos” correctly. Only four remain as round 12 commences. Nihar Janga spells “iiwi” correctly. Smrithi Upadhyayula has been eliminated by spelling “theriaca” incorrectly. Jairam Hathwar spells “calamistrum” correctly. Snehaa Kumar begins round 11 by spelling “rhinolophid” correctly, much to her surprise! Nihar Janga spells “hypozeuxis” correctly! Jairam Hathwar spells “amanitin” correctly. Sylvie Lamontagne spells “venetic correctly. Sylvie Lamontagne spells “venetic” correctly. Rutvik Gandhasri mispells “bettony” and is the first to be eliminated from round 10. As round 10 starts, spelling bee veteran, Snehaa Kumar spells “soogee” correctly! Smrithi Upadhyayula spells “levirate” correctly! Jairam Hathwar, younger brother of 2014 winner, Sriram Hathwar, spells “ptyxis” correctly! Sreeniketh Vogoti, with a hopeful attitude spells “pelaghenite” incorrectly. He receives a big round of applause after thanking everyone along the way. Third speller in round 9, Sylvie Lamontagne spells “panachure” correctly. Boy, that was tough! Cooper’s take away: the importance of work ethic, he tells the ESPN reporter. Snehaa Kumar spells “chubasco” correctly. Cooper, a Japanese American bows out. A big round of applause as he spells “illicium” incorrectly. That’s the end of Round 8, only 9 spellers survive! Nihar Janga: spells “galago” right! Smrithi Upadhyayulu: “epistaxis” — correct! After nearly 30 minutes, nine spellers are still in contention. Jairam Hathwar: “chaussure” — correct! Jashun Paluru becomes the first speller to be eliminated from the final round. Got “vasopressin” wrong! Sneha Ganesh Kumar spells pneumatomachy correctly! Cooper Komatsu goes first — spells the word “myoclonus” correctly!